Green and red yarn. I used brushed Mohair for the wreath and DK yarn for the bow. Pipe Cleaner if you would like your wreath to be stronger, I haven’t used one. I have knitted this entire pattern with I-Cords, which make it super easy. I knitted two 10 inch I-Cords for the wreath. For the first I-cord I cast on 4 stitches and for the second I cast on 3 stitches. 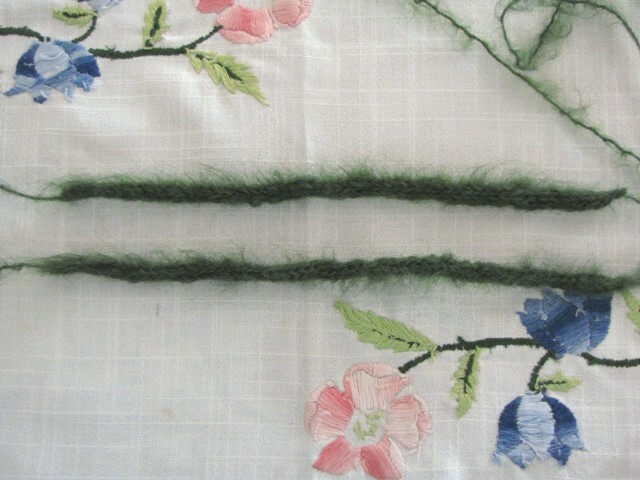 The two I-cords for the wreath, sew in ends. Sew the 2 ends of one side of your I-cords together. Twist your two I-cords around one another. Once you have twisted your two I-cords around one another, sew the other ends together. Now join your ends and make a circle for your wreath. With your red yarn, cast on two stitches and knit a 7 inch I-cord. Cast off and sew in your ends. Fold for a bow and secure with a stitch. Attach your bow to your wreath. This little wreath is wonderful! Beautiful results for so simple a pattern. wat een prachtige krans, beautiful. I love the thinks you make. Very cute :)I just love wreaths! i think i will share this with the kids they will love making them! o i love this little pattern! Beautiful, the kids destroyed my old wreath, so this will be prefect for this year. oh but it’s so cute and adorable! As nice little pull down! Wow…what a beautiful little wreath. I might try and make one myself. Thanks for sharing. Another adorable ornament Linda. I have never tried i-cord knitting, so I really need to find your tutorial so I can give it a bash. Hope you are having a wonderful weekend, it has been a real hot sumnnery one here!! So clever and cute! You do a great job on your tutorials! Youngest will be able to manage this…what an excellent idea THANK YOU!!! You always have the best instructions. Thank you for the instructions. Darling as always, these would make nice holiday napkin rings too! Fabulous idea! I’m off to find the red and green Cascade 220 I have stashed around here somewhere. This would be a great Mom gift as she loves holiday decorations. Thank you for posting it. These would be wonderful ornaments for the kidlets to craft and gift. Great idea! This is very sweet. I think it would be fun to make name tag napkin holders out of these. They are so dainty and charming. Thanks for sharing this Linda. Oh, you are so clever. I really like this. Next step: heavy and unmodest embellishment with BEADS!! But the next thing I want to do is your white sweater. So many things I want to try. Eternity will not be long enough for all the wonderful things to do. How do people every find time to do ugly or hurtful things – when there’s so much fun to be had in the beautiful? I love this pattern. I have been looking for something cute and easy to knit. I love knitting i-cord. I am glad to finally have something to do with it, most of the time I don’t know what to do with my little bits of i-cord that I make, but now I have something cute and easy to occupy my free time. I am going to make some into pins, or maybe sew one or more onto a hat or scarf. I could even make a whole Christmas themed blanket. I have patterns for dolls that can become gingerbread men, and since they are knit as two seperate halves and then sewn together, if I only make one half and then sew it onto a blanket that I knit, I could embroider on features and have a holiday blanket. Or I could tie them onto knit presents. Or glue them onto tags. So many possibilities. Thanks so much. These are so easy that even I can make them, and I am only 10 years old. I was looking at your other patterns the other day but my computer was so slow that it was taking forever for it to load, but now I think I will go back and try them again. These are awesome wreaths. I have two different green yarns and both are fairly thin, so they will probably work. The dark green yarn would be perfect for it, but sadly, I think it might be too thick and become hard to work with. I have a lighter green yarn that is a more appropriate thickness, but the color is not a good one for the project. How many times have I wanted a thicker green yarn? Many, many times, but my yarn stash is very limited and I never stick with a project idea that I haven’t started long enough for it to be worth going to the store and buying special yarn for it. I love making i-cord and never had much to do with it… I need more projects like this. Anybody know of any good i-cord projects? I have been looking for something like this for weeks. I am knitting a cardigan for my grandmother and want a special decoration for the tag. I will definitely use this. But first I need to finish the cardigan… I’m getting ahead of myself again. How clever and how simple. Thanks for sharing it! Fantastic Pattern. Love how you mix the 2 different types of yarn. I did this pattern with a slightly fuzzy white acrylic lace yarn that had tiny sequins woven into it. I knitted a single I cord for the wreath by changing needles and decreasing to 3 stitches. I also added a doubled length of yarn and braided it with the wreath I cord to stabilize the twisting. I added bows in various colors and created a set of mini ornaments for my sons 6 (4 adopted) children. Each ornament also had a tiny Christmas button in the center and was presented to each child in a white voile gift bag with the promise that grandma would add a new knitted ornament each child every Christmas. I love that seeing your pattern inspired a new family tradition and my grandchildren will have a set of mini ornaments to take with them when they leave home! My hope is that years after I am gone, they will remember me and getting this little set of handmade ornaments.